U.S. Border Patrol agents on Wednesday rescued 18 undocumented immigrants who were locked inside a tractor-trailer rig. Authorities report the immigrants are from Mexico, Colombia, Honduras, El Salvador, Guatemala and Kosovo. The incident happened at the Falfurrias Checkpoint as the tractor-trailer rig was referred for a secondary inspection. 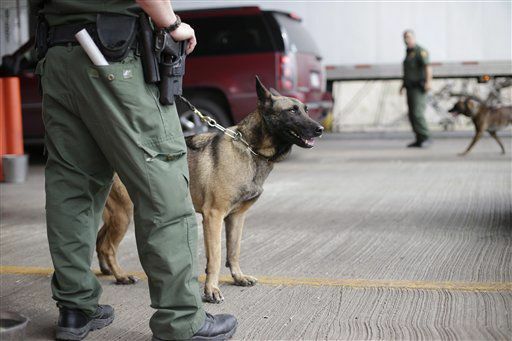 A Border Patrol K-9 alerted the agents that something was inside the vehicle, authorities said. Authorities report the immigrants were concealed within some produce the tractor-trailer rig was transporting. The temperature inside the vehicle was 51 degrees. According to the Border Patrol, the immigrants were locked inside the vehicle and had no way to escape. The agents had to use bolt cutters to remove the lock, since the driver claimed to have no key. The driver, a Mexican national, was arrested and referred for prosecution. The immigrants were to be processed accordingly, authorities said.